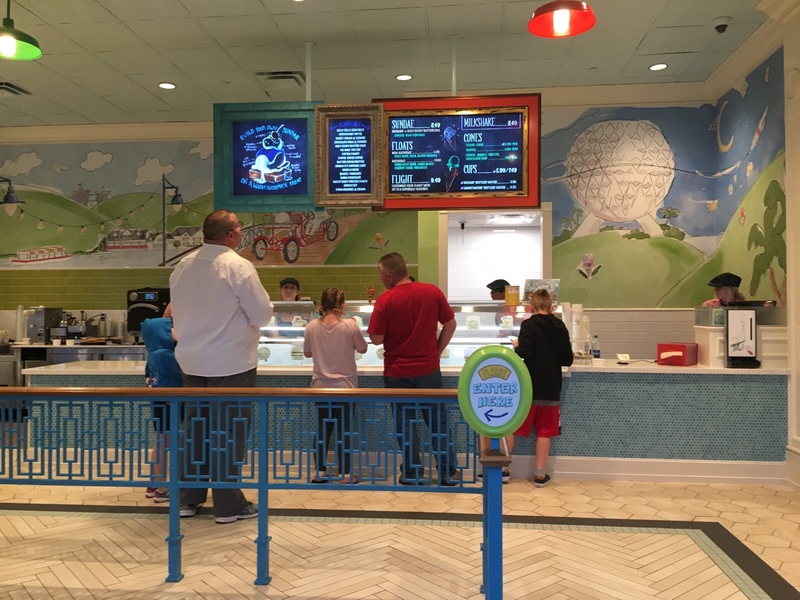 Although people make assumptions about food at Disney – that it’s “theme park food” so it won’t be great, that it’s very overpriced, that it’s bland – some of my favorite ice cream can be found at Walt Disney World. 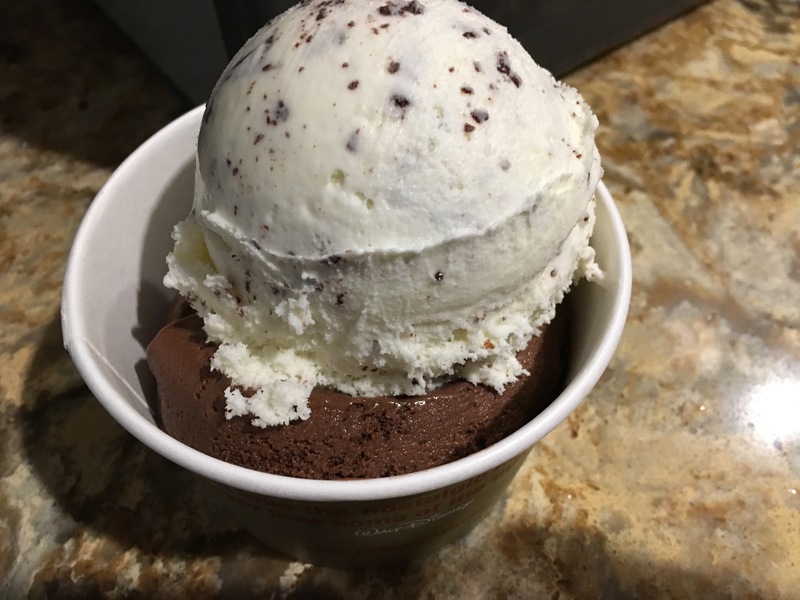 In particular, that would be the mint chip (more of a delicate flake) and the chocolate ice creams from L’Artisan Des Glaces in France at Epcot. But if you’re craving ice cream outside of the parks, Disney has a few other options worth considering. One of them, Ample Hills Creamery, is a relatively new addition. You actually may have seen it on a visit to Brooklyn, New York, where they’re based. 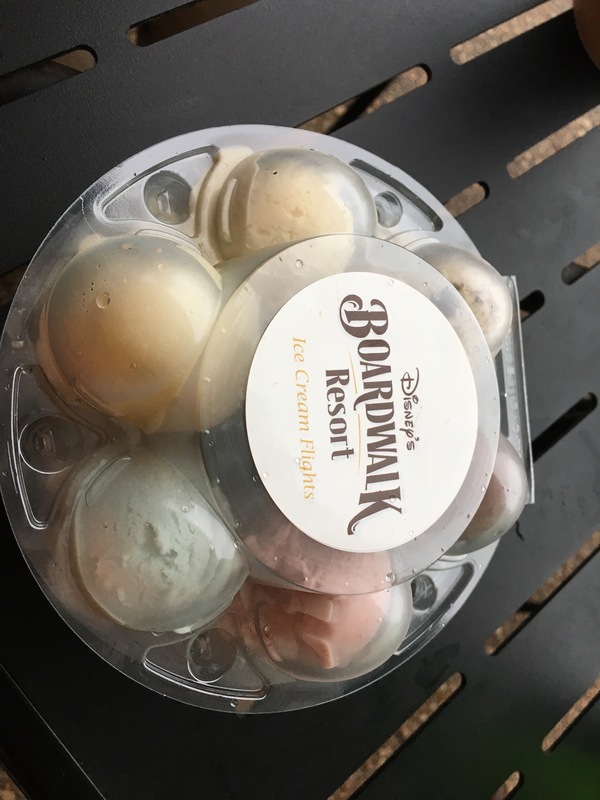 But if you’re like me and missed checking them out on your NYC trip, be sure to visit The Boardwalk at Disney World for shopping, entertainment and some ice cream. 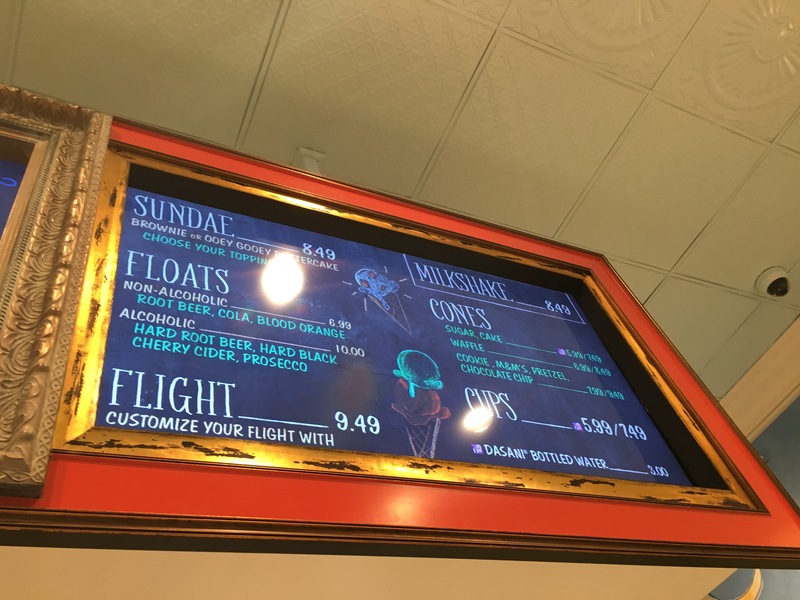 Getting ice cream in Epcot can seem like a deal compared to regular Disney prices. From my visit, I can’t say the same for Ample Hills necessarily. Even outside of the park, your visit isn’t going to be cheap. But the service is fabulous – try whatever you want! Really! 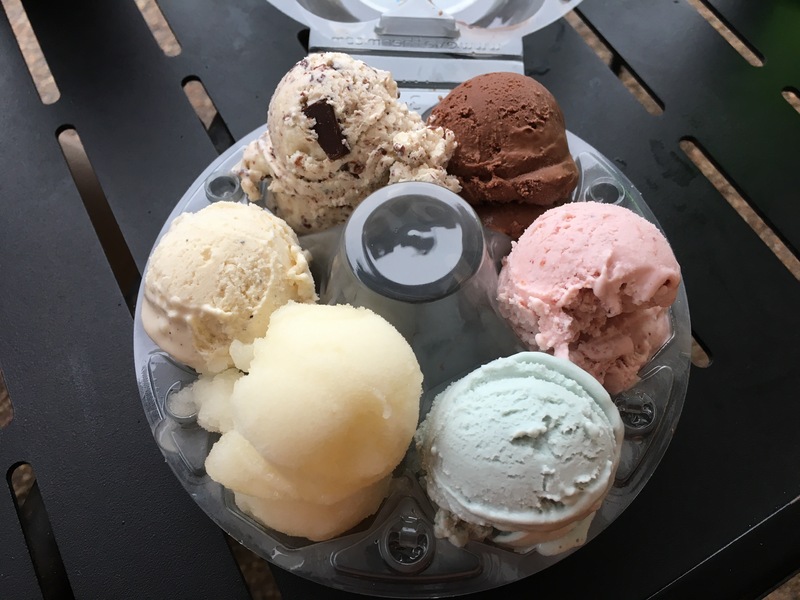 – and there’s not only a wide variety of flavors; there are tons of options, including alcoholic ice cream drinks and a sampler for the undecided like me! My husband, Ross, couldn’t resist the pull of one of their fancy drinks. I couldn’t resist an opportunity to try out many flavors in a sampler. We spent about $20 total – not bad considering Disney alcoholic mixed drinks will usually run you about $10 plus tax. Our thoughts are below. 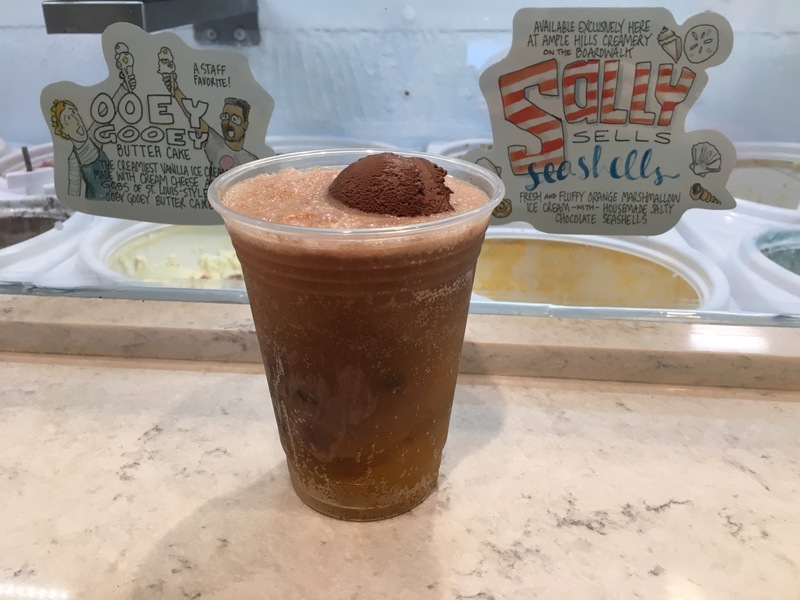 Hard Cherry Cider Float – Ross ordered his with dark chocolate ice cream. An excellent flavor combination. This was sweet but not too sweet, and we both loved it! Seriously consider coming here for a drink, either on an Epcot park day or otherwise. (Ross and I have Weekday Select passes, so visiting here on a day when our passes aren’t valid is a great way to get our Disney fix.) Sea Sells Sea Shells – This flavor is exclusive to Disney World. It’s an orange marshmallow base with chocolate seashells. It’s like a sherbet base, with excellent chocolate pieces. If you’re into those things you’ll love it! Lime and Ginger Sorbet – This combo is an excellent summer flavor. Not only is it a great vegan option, but it’s alcoholic, which is kind of awesome! It reminds me of lemonade. Very refreshing. Cotton Candy – This is nice. It reminds me of an almond-flavored birthday cake. Surprisingly, it’s not that sweet and kind of simple. It’s not a bad take, but different from what I was expecting. The more I ate it, the more I wished it was sweeter. I think I’m a bit biased as I LOVE cotton candy and recently discovered a place on the Outer Banks (Scoops) that perfectly recreates the flavor. Vanilla – This is a very nice vanilla; hardier and more complex than I usually see. It’s almost buttery! Peppermint Patty – They use their own homemade patties in this. Wow. The candies are epic. Although this flavor isn’t as refreshing as what you’ll find in Epcot, it perfectly recreates a good mint candy, which is pretty amazing. It’s very tasty and I enjoyed it more the more I ate it. Dark Chocolate – This is excellent. Not too sweet, perfectly smooth and rich. Strawberries and Cream – Classic strawberry flavor, but it wasn’t as sweet as I expected. It is very good and pairs well with chocolate. It may surprise you if you’re used to the standard strawberry ice creams out there. Overall, ice cream here is an excellent consistency. Sometimes I prefer a bit more sweetness, but it’s much easier to taste the flavors without the added sugar, so it’s a balancing act. Ross votes to combine strawberry and chocolate at his next visit. The chocolate was my favorite by far, but the sorbet is fantastic too, and the mint chocolate is very good. Although strawberry isn’t usually something I seek out, both it and the vanilla are tasty. I would personally skip the cotton candy. In conclusion, Disney World had another excellent ice cream option worth a trip. If you have a favorite place for ice cream in the World, let me know!